This summer, my dear husband and I celebrated our 30th wedding anniversary in Sedona, Arizona. 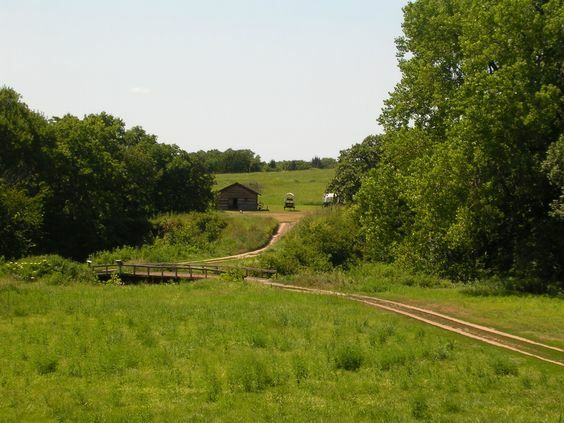 We love the area, the food, and the activities. We took a “Pink Jeep” tour into some Indian ruins and did a little hiking. Our guide, Don, was articulate, genial, knowledgeable, and devoted to his occupation. We enjoyed the short drive to our destination as we each introduced ourselves and shared a smidgen about ourselves. The other couple was a teacher and her husband who loved woodworking. My husband was able to share some discussion about his affinity for woodworking, and when it came time to tell about myself, I said I was an audiobook narrator. To my delight, the Jeep was full of enthusiastic readers and listeners! Don took us on a lovely tour of the ancient ruins and really piqued our interest in the local history. As he dropped us off at the end of the tour, he asked for my business card, and indicated he’d like to listen to one of my narrations. So, I gave him one and told him to email me and I’d help him pick one he’d likely enjoy. About 2 weeks later, Don emailed me, and I helped him find an audiobook he’d be sure to enjoy. The classic “Rebecca of Sunnybrook Farm” by Kate Douglas Wiggin, was what he settled on, and I mentioned how much I enjoyed narrating it. 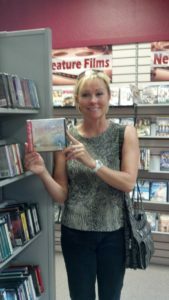 I mentioned, however, that I had never been able to find the original print book in any bookstores or antique malls, and then wished him happy listening. Fast-forward to December 31, when I drove to the post office and picked up my mail. 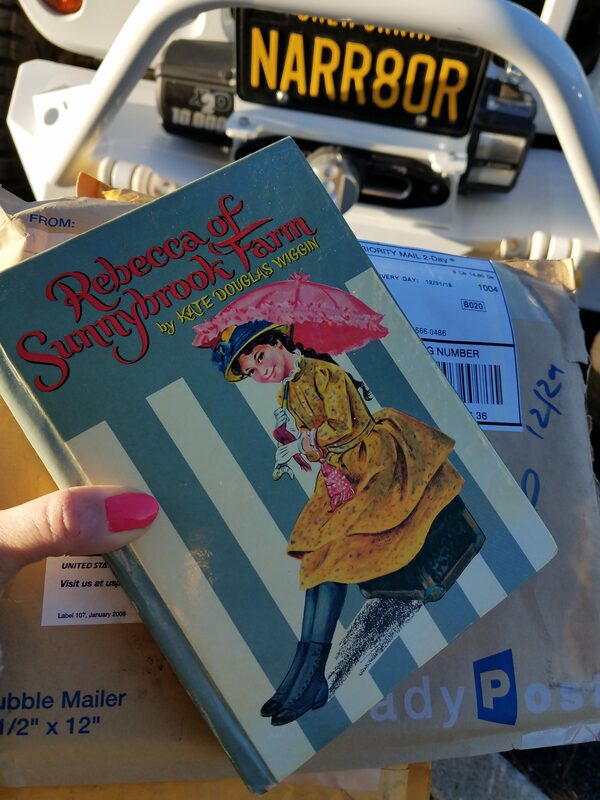 A package was waiting for me, and lo ‘n behold, it was an old hard-back copy of “Rebecca of Sunnybrook Farm” sent by my friend, Don! He’d vacationed in New England over the fall and came across it in an antique store and remembering my lament at not being able to find one, he picked it up and sent it to me. How cool is that!? That is just the tip of a HUGE iceberg of nice people I’ve gotten to meet and know over the years I’ve been a narrator. The overwhelming good will, camaraderie, and generosity of my peers, clients and listeners have kept me afloat many times when I felt like quitting. 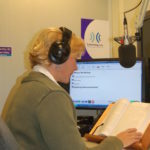 Other side effects of being an audiobook narrator? Learning new words (at least to me) like “hirsute”, and “floccinaucinihilipilification”, and then trying to use them in casual conversation; knowing the proper way to say common abbreviations out loud, such as “I.E.”, texting shortcuts like “IKR”, and many Latin phrases, and TONS of biblical words. (All of this would make me seem a bit hoity-toity, if only I could remember them long enough to use them.) And the obvious draw, I got to read. All. Day. Long. I got to read the most fascinating books I would not have chosen for myself and broaden my horizons. Aside from these wonderful benefits, I get the peace and joy of bringing an author’s words to life. That is really good for my soul. I could see the puffs of my breath in the light of the streetlight, as I quickly trotted two houses down to my neighbor’s home, awkwardly juggling a Christmas gift tucked under one arm, a bottle of wine under the other, and a fruit tart in my hands. The women in my close-knit cul-de-sac have been gathering together for years now for our monthly bunco night, reveling in each other’s company and catching up on milestones and events around the ‘hood. I knocked on her door. A rush of warmth, laughter and delicious smells met me as I stepped into her beautifully decorated home. Exquisite desserts and appetizers covered every available inch of space on the counters and kitchen table, and the livingroom table was heaped in anonymous gift bags and boxes to be exchanged later, in lieu of our usual bunco game. The laughter and stories around the dinner table made the food taste even better, somehow, and there was no rush as we moseyed into the livingroom, dragging kitchen chairs in and squeezing all of us around that pile of unmarked gifts. A quick group photo, and then the game began. Our hostess read a special poem with directional words included in it, and upon hearing those words, the gifts were passed around sometimes to the left, sometimes to the right. At the end of the piece, we each had a different gift than when we’d started. One at a time we opened them, and if we wanted, we could “steal” someone’s gift instead of opening the one at our own feet, and so it was that I was the owner (briefly) of a plush, furry blanket, an electric wine bottle opener, a Moscow Mule set (alcohol included! ), until finally, with one woman left, that was stolen from me, too! I’d had my eye on another decadently soft, fluffy blanket, and had every intention to steal it, when I saw there was one unopened gift bag left and felt compelled to choose it instead of the petty larceny I had planned. 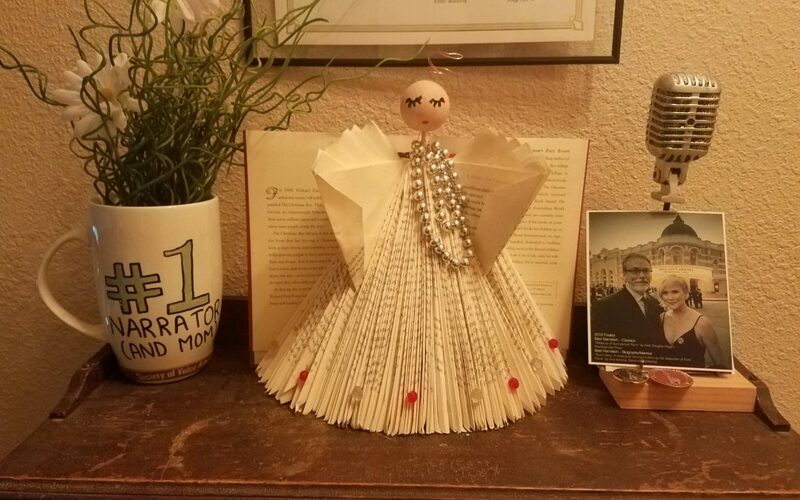 Out of the bag came a very beautiful angel, crafted skillfully from a book, it’s gown and wings formed by the folded pages. I, and many of my neighbors marveled at the coincidence of my ending up with that particular gift, since I am an audiobook narrator and thus, an avid book lover. Now, the premise of the gift exchange is anonymity, but I looked around those lovely faces in the circle and asked who made this gift that fit me so perfectly. The artist was across the room and raised her hand. She said, “I was thinking of you when I made that.” I got a little choked up as I thanked her, and with blurry eyes, looked it over again, and then gently placed it back in its bag. The gift exchange over, we began to disperse, some of us refilling a wine glass or nibbling on an hors ‘d oeuvre, or just moving to chat with someone we hadn’t had a chance to talk with yet. The artist came over to sit by me and explain how the angel was made, and another neighbor came over and asked what book was used to make the angel. I brought her out of the bag and as I turned her over in my hands I froze, my heart stopping for a moment when I read the title of the book, “The Christmas Box” by Richard Paul Evans. In a flash I was transported to 1995, sitting by my father’s bedside in the hospital. The flashing lights of a heart monitor and the rhythm of the respirator breathing for him weaving a sad background to my voice, as I read this very same book aloud, to his unresponsive face. I remembered the smell of sterile equipment and the faint aroma of the peach lotion my sister and I had massaged into his feet and hands earlier in the day. But in the wee small hours of the morning, there I sat in his darkened room in the ICU, tears streaming down my face, as I read him this beautiful Christmas story about a widow and a young family that comes to live with her. Quickly refocusing my attention on the here and now, and the book-angel in my hands, I couldn’t contain the sob that escaped me, and tears began to course down my cheeks. I was so embarrassed to be crying at this happy gathering, and felt my face grow red as I tried to squelch the emotions that overwhelmed me. My angel-maker gracefully and perceptively distracted me by describing how she crafted the gift, and I was so grateful for the chance to regain my composure, if only for a moment. I wanted to share with everyone how touched I was by this poignant coincidence, but every time I opened my mouth, my voice quavered in a high-pitched choking sound, and I would break down again. I think word eventually made it around the room, and my dear friends who were not clustered around me as I blathered, now all know the reason for my emotions. The day after the party, as I write this, my emotions are still raw and near the surface, and I feel a headache coming on from the effort of keeping them under control. I need to get into my recording booth and finish narrating a book whose deadline is a bit too close for comfort, and if I cry, I lose half an hour of valuable work time, due to the drippy nasal tones that will be audible I my voice. 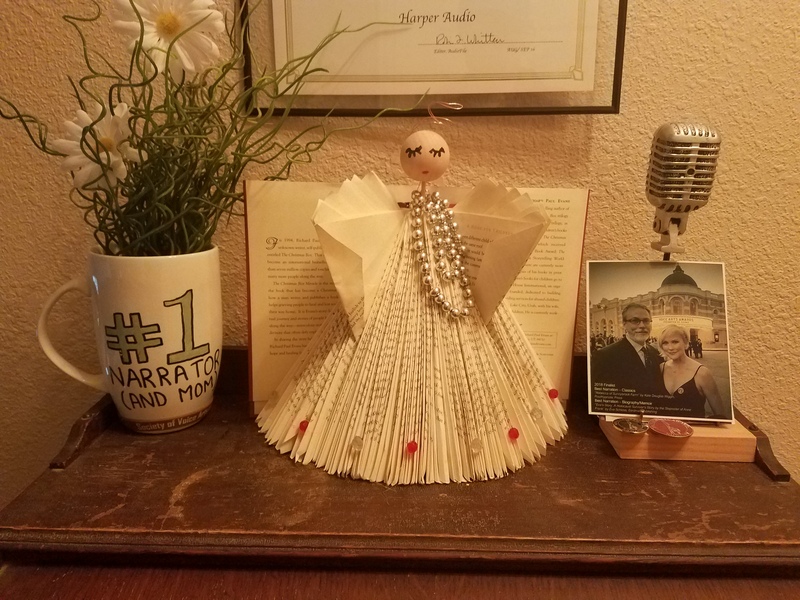 I have placed my book angel outside my booth on my great grandmother’s antique sewing machine, which houses my recording equipment. There she will stay, long after the Christmas decorations have been put away in the garage. I am so grateful to have been in the presence of dear friends when this happened, and I am also grateful that the memory of my father is present with us this Christmas in a new and beautiful way.